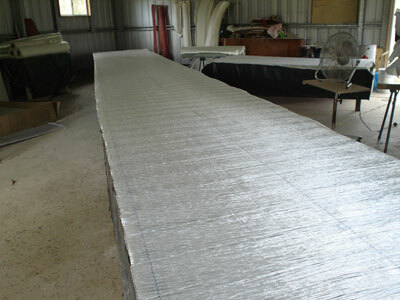 We construct our panels by joining the foam sheets together the full length of the boat and then covering with glass. This method works well and calculation of soak coat recommended by the manufacturer of the foam and the theoretical amount of resin needed to laminate the glass are well within accepted levels. We use LSE (low styrene emmission) resin and the smell of polyester resin is minimal. So it shouldn't annoy the neighbours. Building a foam sandwich flat panel boat is similar to building a boat in plywood. 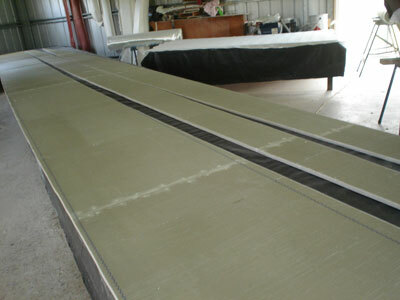 Separate sheets of foam can be laminated, the panels cut out and then scarfed together by gluing and taping if desired. But if you have the space it is much simpler to join the foam before it is laminated and the panel cut full length. The panel is smooth so it is easier to fill the boat before painting and there is no need to use a string line to line up separate sections of the hull panels. 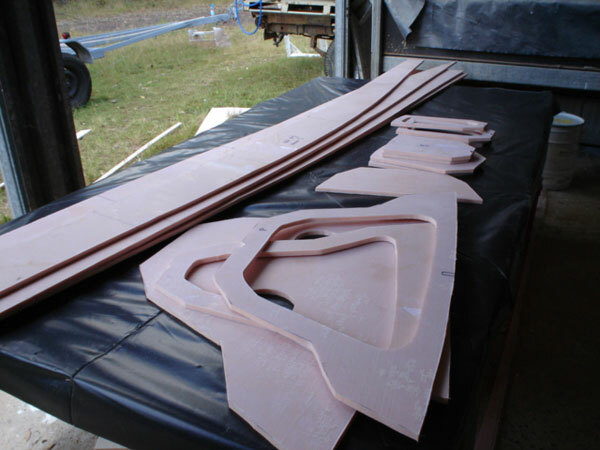 The foam is cut to the desired length and the edges glued. We use resin mixed with aerosil. The foam is held in place with drywall (gyprock) screws. We place a piece of plastic under the joint to protect the table underneath and prevent our panel becoming a permanent part of the table. 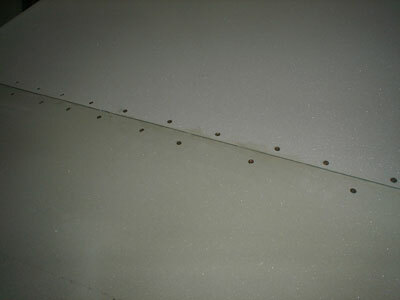 Once the resin sets (usually about 2 hours) the screws are removed. You can fill the screw holes with filler or leave them to fill with resin as you laminate the foam. If you don�t fill the holes the resin will pass through the holes leaving a blob of resin underneath. This is easy to remove with a small grinder with a sanding disc. Lay the glass over the length and smooth. Cut peel ply in short lengths (about a metre in the beginning). Mix the resin and pour it over a section of the foam (about a metre to begin). Allow gravity to help saturate the glass and soak the foam. Using a metal drywall spatula (10 inch wide works well) spread the resin and work it into the glass. When you are satisfied the glass is saturated and there are no air bubbles, add the peel ply. Work the peel ply until there are no air bubbles or excess resin. Sometimes a small amount of resin poured over the peel ply makes it easier to work the air bubbles out. Finish one area then move on to the next until all the foam is covered with peel ply. The time to build the full length panels is approx. 10% of the total build-time of the hulls but once the panels are cut out they are very quick to set up on the building frame. 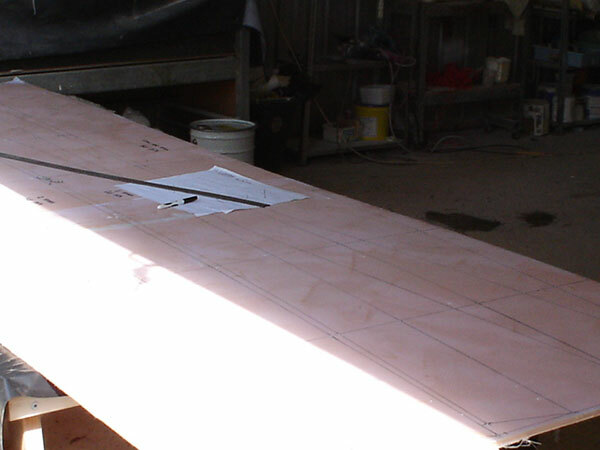 Most of our customers build their boats using plywood but that is beginning to change. I can only think it is the rising price of plywood and epoxy resin. We use polyester resin on our boats, partly for the cost and partly for the safety reasons. The Klegecell sheet size we are currently using is 1220 x 2430 (the size seems to change for each order). 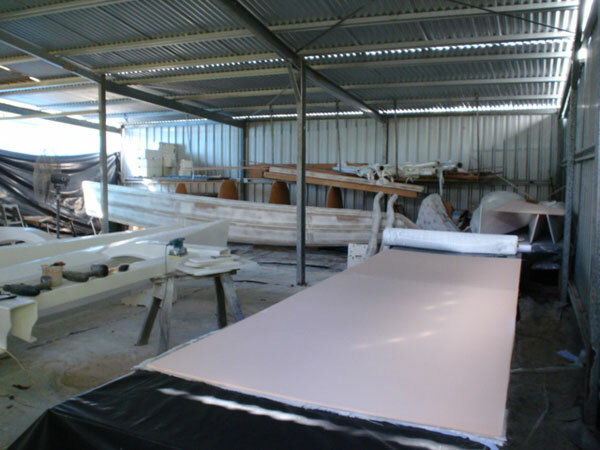 On the smaller trimarans (up to the Scarab 650) the cost of a single finished polyester resin panel (foam, glass, resin and peel ply) is $197 compared to $297 for epoxy(10mm foam and 400gsm glass). For our larger boats including the Scarab 32 the cost of a single finished polyester resin panel is $230 compared to $380 for epoxy(12mm and 600gsm glass). This is a saving of between 30% - 40% on the cost just by switching resin. All the costs are approx. and in AUD . Panels laminated and lofted for the Scarab 350.